Sending email as alias in office365? the only big thing missing was that you could not "send" from any email other than the primary email. so in the example above i could not send email as orders@example.org or newsletters@example.org. I could only send email as bob@example.org. Is this still true or can you send email from aliases? I don't want it to look like it came from the primary email "orders@example.org in care of bob@example.org". The email i send with an alias should really look like it came from the alias. This is the only reason i'm on GApps and i'm hope to swtich back. Is this feature still missing? Re: Sending email as alias in office365? Agree with shared mailboxes. You can configure the mailboxes to forward email to your mailbox, and utilise Send As permissions to send from the alias of the shared mailbox. But be aware that shared mailboxes cannot be accessed from mobile apps (as a warkaround, from mobile you can use the Web UI, of course...). You can create an aditional POP or IMAP account in your Outlook to send with the aliases. Is the best solution that I use and several clients, if you want to keep in the same Mailbox. Doesn't this solution result in getting all emails for the mailbox twice on the client? That does not sound practical. You can select just a few days on POP/IMAP, is just a way to send messages from other alias, it's not a perfect solution. It works, and you can arrange the view on your Outlook, do these acconts to be on bottom of your stucture. I have had a similar requirement and have tried both an Exchange Group and Shared Mailbox for the ability to receive and send emails using an alias. I prefer the Shared Mailbox as this is simpler to setup and use. Yup Brent as Leighton says you can use a distribution group for this. Set it up with the alias as its email, configure it with you as a member, and importantly with send-as permission for yourself. You can then sent emails using that From address. Inbound emails will be forwarded to your inbox. We use Shared-mailboxes more, but the group sounds what you are looking for. I would say go for Shared Mialbox because you can access it independentaly, rather DL where you can only send and receive. 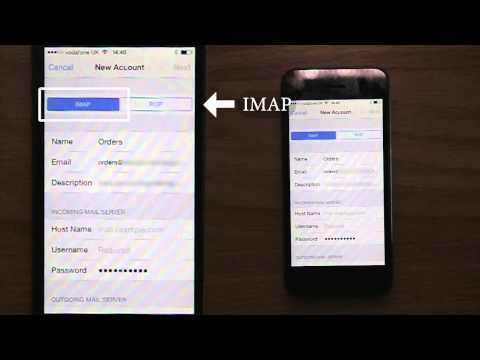 This video will show you how to add an office 365 shared mailbox to your iPhone mail to allow you to use the shared mailbox to send and receive messages. you can try to use ChooseFrom 365 cloud service. I know this thread is a little old, but it ranks highly under a Google for this issue so wanted to add more information. It is now possible to send for alias addresses quite simply using O365 and Outlook. Simply add the alias to your account in the usual way in O365 Admin. In Outlook, open a new mail and from the "Options" ribbon ensure the 'From' button is pressed to reveal this field. Click this drop down and select "other email address". The next time you return to the from drop down, the address will be there to select with 1 click. Hope this helps someone one! James, is that possible from Outlook for Mac, or only Outlook for Windows? You have a user with mailbox and e-mail address userA@contoso.com and you want him to receive and send mail from an address userA@aliasdomain.com. 2. Add the user's primary account as a member to this distribution group (Members => userA@contoso.com) to make sure e-mail gets delivered to his mailbox. Now this user can receive e-mail on his new userA@aliasdomain.com e-mail address + send from this e-mail. The only thing he needs to do is in Outlook or OWA select the From and change it to the alias address. I don't have access to a Mac so can't test this. I tried in Outlook online and was unable to perform the same actions. AFAIK, It is still not possible to send as an alias. Following your steps, the recipient will get anyway an email sent from the primary address and not from the alias. Did you try the steps I’ve written down? I have this implemented at several customers and is the only solution to send from an alias. In fact, it is one of the veeery classic workarounds for solving the problem. When I look at the headers in my outlook, the address typed is shown. Do you have another completely different email address? Try to send an email from an EOL alias, using your technique, to that email address and you will see that the sender of the email is, in any case, the primary address and not the alias. As long as the domain being used is served from the same server you're sending from a different domain is no different to an alias of the same domain. I have not checked to see if an address served from a different server would work, I would expect it not to as doing so would probably fail SPF check and thus lead to a bad experience. You can add your account as IMAP. Password: Your Davidson email password. User Name: Your full Davidson email address. This worked for me in an office 365 shared mailbox on an android device. Has anyone else actually been able to get this to work? In Outlook Web, I can change the from address to one of my aliases. I get no error message, the email sends, but it shows up as from my primary smtp address. I can send as group email addresses in both Web Outlook and Windows Outlook with no problems. It's extremely annoying - I agree with the OP that using shared mailboxes etc. is a kluge. I really see no reason not to make it easy for people to use multiple domains to send and receive email - it's hardly as if this is a backdoor to having multiple users sharing a licence - you get one mailbox! In fact, the facilities with shared mailboxes make it easier to do that in some respects if you're willing to have multiple users sharing a login. This topic has been discussed infinitely in this community and in many other forums. Sending as an alias in Exchange has never been possible and indeed it is still not possible. There are workarounds but, as you noted, they are viable, but not satisfactory. This is the present situation, unfortunately, and that's all. This is manifestly untrue. 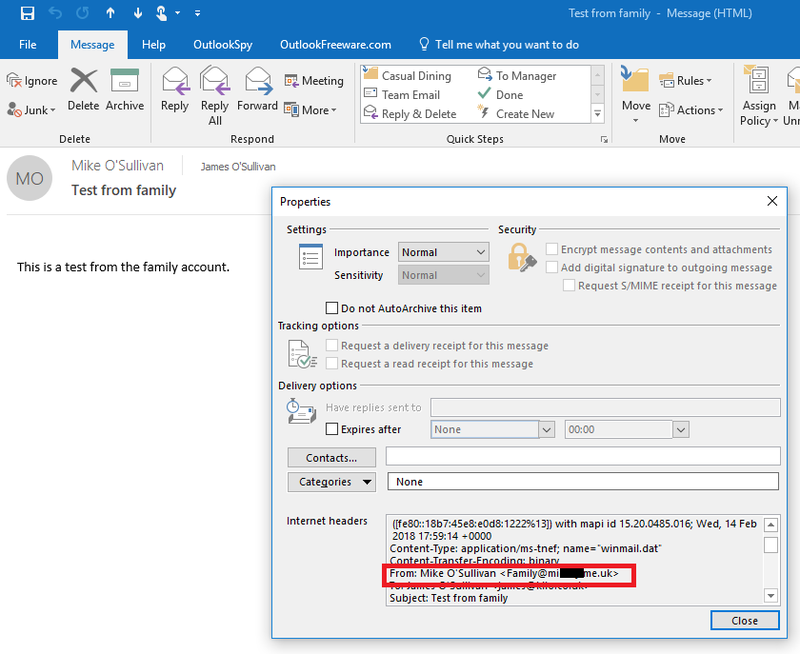 My previous post details steps for this to be achieved in a trivial way using Outlook 2016 and Office 365, one of the most common deployment combos. Hi Tony, can you please shed some light? Is it possible in Exchange to send as an alias? Hi @James O'Sullivan. Edited because I've just looked at the images you posted. Have you tried sending from an alias with a different domain (but one that is registered in O365)? I note that your aliases are all in the same domain (unless differences are redacted)? I've tried sending from aliases both in the same and different domains as my primary smtp address and neither works. If it is definitely working for you, there must be some configuration (permissions, perhaps) or other nuance of how domains are set up (or maybe hosted or not hosted in O365) that is different. please do me a favor and send a test message with subject "James O'Sullivan test" from Family@mi******.me.uk to viciva(at)yahoo.com . My experience in trying James' solution is identical to Nick's. I'm able to enter the alias as directed and send the e-mail, but on the receiving end, it does not appear to actually come from that address. I see the same </o=ExchangeLabs/ou=Exchange Administrative Group... string of characters in the From address in my Sent Items. I have done some testing with regards this and while it works internally, it doesn't work for external emails, which is a shame. Anyone know if there's another post that may be more popular? Strange. I decided to go with the DG option to allow me to send mail from the alias in an alternate domain. Let's call them nick@primarydomain.com and nick@aliasdomain.com for these purposes. This meant removing the nick@aliasdomain.com address from the list of addresses associated with my own mailbox, then creating the DG as you describe, assigning permissions etc. In the DG, I set the display name and alias values to the same values as my own account, merely because I want my name to show the same way. It didn't work!!! Email shows as from nick@aliasdomain.com in sent folders on all my mail clients (which it didn't when the alias was attached to my mailbox directly). But it arrived at the recipient (externally) as addressed from nick@primarydomain.com. I also tried sending a mail from nick@aliasdomain.com to nick@primarydomain.com and it shows as from nick@primarydomain.com internally as well. As a troubleshooting step, I set up a new DG for someoneelse@aliasdomain.com and tried sending from that address. It worked no problem from Outlook Web, immediately. Email arrived from someoneelse@aliascomain.com. I tried changing the display name and alias on the original DG. Didn't make any difference. So is it a a matter of time? That Exchange needs to propagate the change for a given recipient that was previously an alias directly against my mailbox and is now a DG? Or is something is stuck in perpetuity because the address was previously an alias for my mailbox? So this is confirmed? Setting up the alias as a Distribution Group works to send mail from such alias on OWA? The only problem with these various solution is that you can really only have 1 alias to send from, as you can't use the same display name. I've got varying versions of my surname e.g. james@surname.xy, james@surname.net.xyz, james@surname.co.xyz. In this scenario I'd create two distribution groups, or shared mailboxes, but they can't have the same display name.. so I'd have to create James L 1 and James L 2 (as an example) but then the from address ends up being James L 1 (james@surname.xy) which is stupid.. In your scenario, you should have added several domains to the tenant (i.e. "surname.xy", "surname.net.xyz", etc.). Hence you could indeed create separate DLs and/or SMs such as "james@surname.xy", "james@surname.net.xyz", etc., which do appear as senders. as far as I understood he's talking about the display name. As above, I'm talking about the display name. I already have the domains added to my tenant so that part isn't the issue. It looks the only way to get what you want is using the cloud service I've mentioned earlier. @Victor Ivanidze I did look at Choosefrom 365 but I don't want to send my emails through an unknown third party (to me), nor edit the subject to define which address to send from. I figured out a kludge way of having multiple shared mailboxes with the same name, is to utilise a spare license and create a normal user with mailbox (with the same name) on the alias domain, then convert it into a shared mailbox. Have you tried to change the display name by powershell? I know this may have been an old thread but I didn't see any of the real answers here. Maybe my setup is different enough but this is as easy as typing in the alias that you want to send from. Although this has been available in earlier versions, I'm now using Office 365. 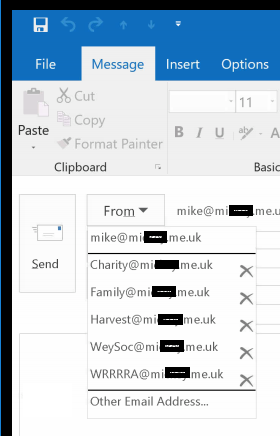 The From field of an outgoing message is a dropdown field and in the dropdown I can select to send from any of my current email accounts OR I can select the option listed as "Other email address". With this option, I can enter any other address I chose and the recipient sees this other address as the source and the reply goes to the "other" address. You do need to select one of your current email addresses for the outgoing SMTP service for delivery, but the recipient should see the Reply-to as being the other address you specified. A review of the recipients header would reveal the source as your SMTP server, but the reply should go to the entered address. let's suppose your default email address in Office 365 is SMTP:charette1@contoso.com and your alias is smtp:charette2@contoso.com. Could you please explain how can you send as charette2@contoso.com using Office 365 OWA? How the hell do i send file via chat??? Outlook stops sending and receiving after being opened for a few hours.